To fix its financial deficit, Muncie Community Schools may be cutting some classroom programs. School closures and privatizing services have not made enough of a dent. Muncie Community Schools emergency manager Steve Edwards, whose team is managing the district’s finances through December, says no one wants to cut programs. But his team’s strategy is changing. 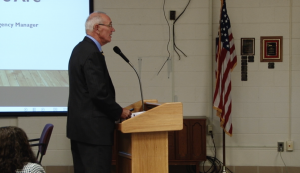 “It may very well be that Muncie cannot afford all the programs that they have,” Edwards says. Edwards would not single out programs to be cut. But, he says Administrator Assistance will be looking for public input at two upcoming forums, one on Oct. 5 and the other on Dec. 7. It’s all in an effort to cut the overall budget from $46 million to $34 million over the next two years. Maintenance spending is also going to change. MCS Chief Financial Officer Bob Coddington says the new plan is simple. “Which roof are we going to fix? The one that’s leaking,” Coddington says. Coddington says the plan is to spend by need instead of taking preventative measures, because the district just isn’t there yet. Meanwhile, Administrator Assistance founder Steve Wittenauer is still asking the community to think positively. Wittenauer says he hopes once the financial situation stabilizes, families who have transferred students will return them to Muncie Community Schools classrooms.